I finally finished Process Theology. I don't feel like writing a whole lot about it right now. Suffice it to say, I was struck in later chapters with process theology's emphasis on the interrelatedness of creation, and how the destruction of one part affects others. The chapter on Jesus was also very good, as Cobb talks about how he revolutionizes the concept of diety if we truly allow him...Cobb talks about how convoluted the doctrine of the Trinity is, especially if we make God the Father/Creator more God-ish than Jesus even as we insist that they're all equal. If we believe that we see God in Jesus, Cobb says, then we must consider what it means for our concept of God as we watch Jesus suffer, sacrifice, show weakness. If we simply argue that that was only Jesus' human side doing or experiencing those things, then we miss something about what God is revealing to us. That concept seems especially timely a little over a week away from Holy Week. Twilight came out on DVD last week. Because Coffeewife is such a nut about it, I've seen it, or at least pieces of it, 7-8 times. Help me. Flight of the Conchords had its season finale this past Sunday night, and according to many places around the internets it was probably their series finale. After two short seasons (only 12 or 13 episodes each), the show is apparently at an end. In this last episode, the guys wake up first to do a Stomp-like musical number that includes banging on glasses and pots, stomping on trash can lids, and even involving a few New York pigeons. Then they find out that they can't pay their rent because they've been paying in New Zealand dollars instead of American dollars. This somehow leads to their staging a musical about their lives (a sort of retrospective of the show) written by Murray, which reveals that they're illegal immigrants. This would be all well and good, except that a few American customs types had come to see the musical, and the guys are shipped back to New Zealand to resume their lives as shepherds. The show ends like it began, with the guys using wire fences, a tractor, and even a sheep for another Stomp-like piece. The second season wasn't as good as the first, but I loved the understated humor and goofiness of the show in general, as well as the wacky original songs. I don't have that many current shows that I keep up with, and now I have one less. 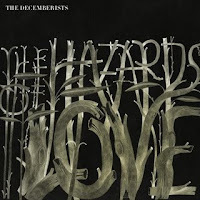 The Hazards of Love by The Decemberists - When I first heard The Decemberists' Picaresque a few years ago, I was immediately taken by their style: folk-rock supporting stories that frontman Colin Meloy writes like classic lore: a mariner seeking revenge on the man who ruined his mother, a barrowboy still selling his wares on the streets long after he's dead, a forbidden love between an aristocrat and a peasant. You can't deny their unique style, which they focused into a theme album in The Crane Wife, as beautiful and poetic and creative an album as there's been. They've now taken that poetry and creativity and poured it into a second, more ambitious theme album, utilizing a range of instruments and a few guest voices. Entertainment Weekly gave this album a D+, which only reveals how little they know about music. They should stick to the latest tripe from Beyonce and Rhianna. Those who appreciate something ambitious and truly creative can check this out instead. In Rainbows by Radiohead - I've been meaning to pick up this album for months, especially after seeing them perform "15 Step" at the Grammys with the USC marching band. This is as great an album as they've released, albeit seemingly a little more mellow. "All I Need" stands out to me as a song with a haunting sort of groove to it. The Green World by Dar Williams - I have a few friends who really like Dar Williams, but I can't say that I ever really had a listen for myself until this week. That said, this is a fun album. In front of folk-rock, or maybe rock-folk, Williams is irreverent and wistful. Occasionally, she gets more serious, but for the most part as she muses on the strangeness and complexity of relationships, dreams, life in general, she does it with a certain light-hearted humor that draws the listener in.